Figure 3 illustrates a typical bidirectional CWDM optical interconnect application. Wavelengths 1-5 and 7 are used to transmit information topside while wavelengths 6 & 8 receive data from the topside location. These ‘return’ sig- nals may be Ethernet data, contact closures, etc. Each ? ber at the input/output of the optical mux carries its own unique wavelength. Therefore a standard power meter will work to measure the wavelength’s optical power on its associated ? ber. However, the common port of the mux/demux con- tains all of the wavelengths on the one ? ber. This is where the CWDM power meter becomes useful. CWDM power meters will demultiplex each of the indi- vidual wavelengths present on the tether’s ? bers and re- port their associated power either in a graphical or tabular format. These meters have various features which allow individual wavelength’s power to be displayed or displayed as a group and output for further processing. 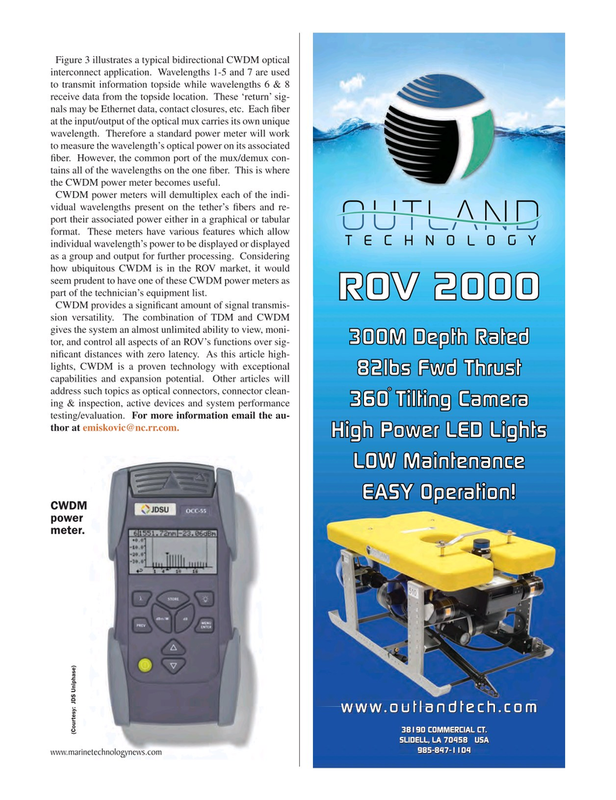 Considering how ubiquitous CWDM is in the ROV market, it would seem prudent to have one of these CWDM power meters as part of the technician’s equipment list. CWDM provides a signi? cant amount of signal transmis- sion versatility. The combination of TDM and CWDM gives the system an almost unlimited ability to view, moni- tor, and control all aspects of an ROV’s functions over sig- ni? cant distances with zero latency. As this article high- lights, CWDM is a proven technology with exceptional capabilities and expansion potential. Other articles will address such topics as optical connectors, connector clean- ing & inspection, active devices and system performance testing/evaluation. For more information email the au- thor at emiskovic@nc.rr.com.